It was Pi Day over the weekend. March fourteenth. Which is something a lot of scientifically- and mathematically-inclined people already celebrate. 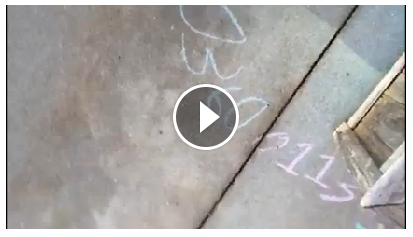 A friend of mine who’s currently a professor of economics stumbled across a sidewalk where local children had used chalk to write out many decimal points, then filmed himself walking along, recording his footsteps tromping along the digits. His film was about two and a half minutes, which means he recorded about a thousand digits… a tiny bit of pi. Which is cute. A nice way to convey the un-ending, patternless strings that you get from irrational numbers (although any irrational number would do to show this; pi just happens to be the most famous, even though the coolest is Euler’s number e, in my opinion). You could walk along a representation of pi for a long, long time and it would never look quite the same. But I think there’s a slightly cutesier way to convey how strange irrational numbers are. And this one works for you liberal arts majors out there, too! Like, okay, let’s imagine two things to start: 1) You’re trying to write a short story, and, 2) You and some friends have decided to use a code to represent the alphabet, maybe something like 01 for a, 02 for b, 27 for A, 28 for B, and so on through all the uppercase and lowercase letters. Might be worth throwing in some punctuation, too… you’ll have the numbers 73 through 99 waiting for you, so that’s a lot of special characters you could cram into your code. Given those two assumptions, the neat thing about pi is, it already wrote your story. Hamlet is in there, too. Every work of literature you’ve ever loved, snuck into pi in code. Because the series of digits goes on forever, and because the appearance of digits one to the next is (as far as anyone knows) patternless the entire way, all the literature that’s ever been made and all the literature that ever will be is already there, hiding deep in pi.